Overflowing love begins in the same place for everyone, it’s something that God does for us when we open our lives up to God, allowing God to fill us. It begins with Jesus. The deepest longings of our hearts cannot be fully satisfied by anything in the world, and even trying to do so will lead to more emptiness. God alone meets our deepest needs. 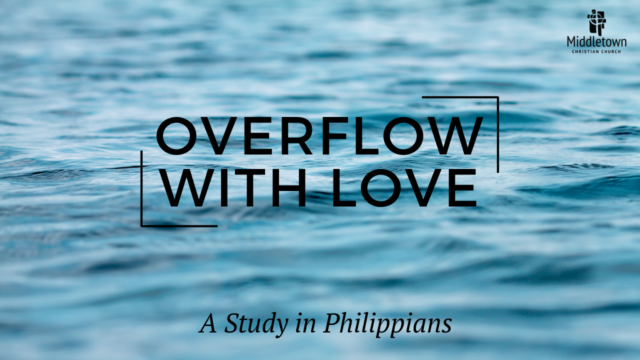 What do you hope to learn through this sermon series in Philippians? What do people see flowing out of you? Apathy, fear, anxiety, or love? Who has been an example of overflowing love in your life? What difference does it make when the love of Christ is flowing out of you? Watch the Overflow videos & download the discussion guide here. Learn more about the Apostle Paul by listening to last week’s sermon here.